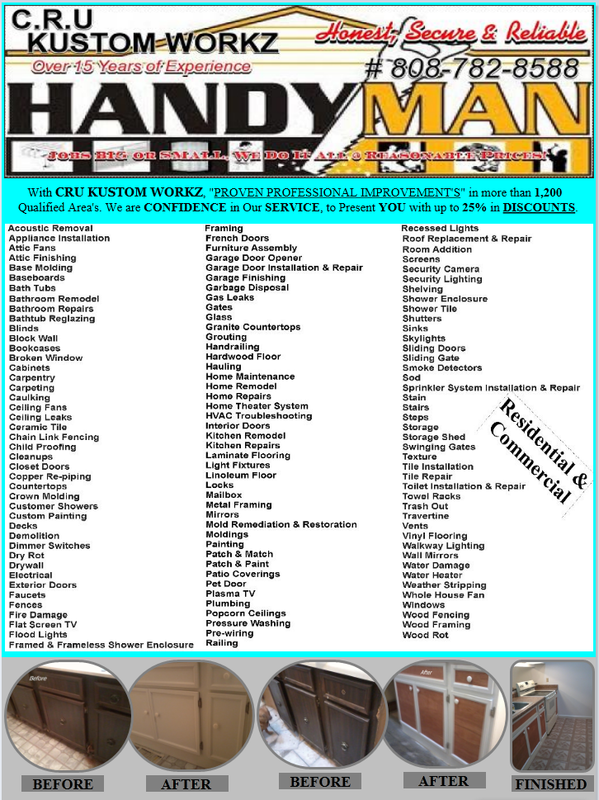 Handyman, Home Improvement & Repairs, Cleaning and Moving Services. Families, couples and singles hire CRU KUSTOM WORKZ because we’re all so busy these days! If we all had one less thing to do, especially house cleaning, we could get more important stuff done and enjoy more quality time! That’s why people choose CRU KUSTOM WORKZ Handyman, Home Improvement & Repairs, Cleaning and Moving Services! Most of our clients use our express cleaning service for regular visits, but we also clean for other reasons: Parties (pre or post), Seasonal Deep Cleaning, Company Sleep Overs, Pre-Post-Final Construction or Renovation and sometimes, just for a well-earned indulgence! Every day we sign up new customers who want to do more to protect their health and understand that our express cleaning service is a practical, affordable way to reduce the amount of harmful toxins in their home environment. We are the first cleaning service to make a commitment in environmental cleaning for the health of our customers and our cleaners. At CRU KUSTOM WORKZ, we believe a clean home is a happy home and that is why we provide consistent, thorough and express house cleaning for all of our customers, every time. Along with our regular house cleaning tasks we also provide the little extras that make the difference between a sparkling clean and a deep cleaning. Every home needs some special care once in a while and it’s always a good idea to do a deep cleaning periodically, like when the seasons change. No worries, in addition to providing you with consistent and reliable cleaning, CRU KUSTOM WORKZ also offers a deep cleaning option to take care of those necessary extras. It’s hard to believe we could be even more thorough, but our deep cleaning truly takes your home to a whole new level of clean! Below are some of the deep cleaning tasks we offer, broken down by room. *Where items are present in or above cabinets, client must remove & replace items before & after we clean, this is to ensure that we are not held liable for any item damage. *All cleaning with HEPA Vacuum will be done by request only. Call CRU KUSTOM WORKZ Today to schedule your homes Deep Cleaning Service!